Vienna is a popular tourist destination and if you are one of those who want to visit Vienna for two weeks this spring, our team found you a flight with departure date on April 1 and return date on April 15. 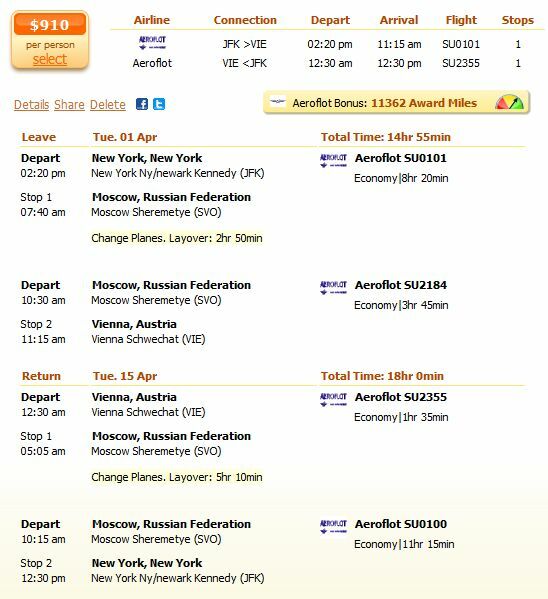 Book now the Aeroflot flight from New York to Vienna from $910 and save money. The flight has one stop. You can search for the Vienna airfare deals of our partners in the box below, to be sure that you found the best price at this moment. Maybe you find an even better offer for you. You will fly from the Kennedy International Airport (JFK) to the Moscow Sheremetye Airport (SVO), where you spend almost 3 hours before you continue your flight to the Vienna Schwechat Airport (VIE). On your way back you have the same stop in Moscow for 5 hours. Please check the details of this Vienna flight in the screenshot below. We checked the Vienna flight offers of other airlines. The next best price has the LOT Polish Airlines with $985. The Thy Turkish Airlines has tickets for $1009 and there is a multiple airlines flight for $1037. The latter has direct flight to Vienna and one stop on the way back, the other two have one stop each way. At the Aeroflot you can have one free baggage of 23 kg. The second baggage costs $50 and a third or any additional piece costs $150. For an overweight baggage until 32 kg you have to pay an additional $100 and for a baggage between 32 kg-45 kg you have to pay $150. It is the same with oversized baggages of 158-203 cm respectively more than 203.